Posted 3/28/2019 1:33pm by Andrea or Matthias Reisen. Posted 3/28/2019 1:16pm by Andrea or Matthias Reisen. Posted 2/7/2019 5:10pm by Andrea or Matthias Reisen. Posted 1/29/2019 8:44am by Andrea or Matthias Reisen. Mushrooms are delicious, nutritious, and fun to eat, plus have a large array of medicinal qualities. 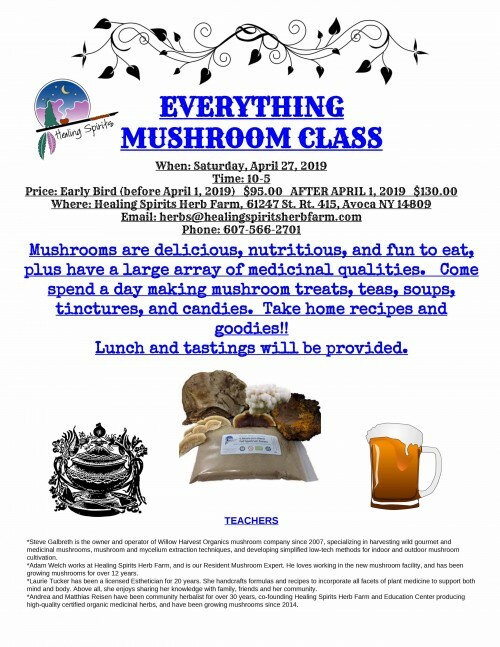 Come spend a day making mushroom treats, teas, soups, tinctures, and candies. Take home recipes and goodies!! Steve Galbreth is the owner and operator of Willow Harvest Organics mushroom company since 2007, specializing in harvesting wild gourmet and medicinal mushrooms, mushroom and mycelium extraction techniques, and developing simplified low-tech methods for indoor and outdoor mushroom cultivation. Adam Welch works at Healing Spirits Herb Farm, and is our Resident Mushroom Expert. He loves working in the new mushroom facility, and has been growing mushrooms for over 12 years. Laurie Tucker has been a licensed Esthetician for 20 years. She handcrafts formulas and recipes to incorporate all facets of plant medicine to support both mind and body. Above all, she enjoys sharing her knowledge with family, friends and her community. 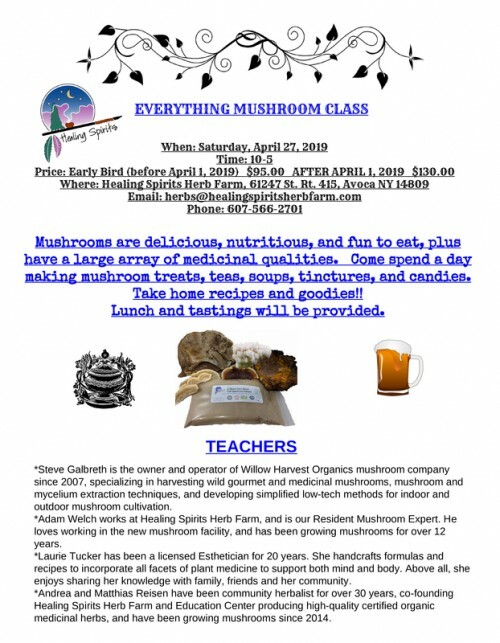 Andrea and Matthias Reisen have been community herbalist for over 30 years, co-founding Healing Spirits Herb Farm and Education Center producing high-quality certified organic medicinal herbs, and have been growing mushrooms since 2014. Posted 1/24/2019 9:07am by Andrea or Matthias Reisen. 1. Store in Airtight Containers. Oxygen will degrade herbs over time, so storing your dried herbs in airtight containers is best. Glass jars are the absolute best. Glass allows the herbs to breath, keeps excess air and moisture out, and maintains the integrity of the herb for the longest period of time. If the lid of the jar you are using has cardboard in the inner lid, remove it, as it invariably contains moisture. Avoid using plastic if possible, as it may leach chemicals into your herbs. I like to store my dried herbs in glass canning jars. I love that they come in all different sizes as some herbs I use a lot of and others I only use sparingly. 2. Keep Out of Direct Sunlight. While those rays of sunlight hitting your jars of herbs might look pretty, they are actually doing damage to the potency of the herbs. Heat and Light will destroy the essence of the herbs very quickly. For this reason, it’s best to store them out of direct sunlight. Keep them in a closed cabinet or make a curtain to cover them if need be. 4. Be Sure to Label Purchase Date. Keeping track of how old your herbs are is an important habit to develop. Whenever you put a new herb on the shelf, label what it is and when it was harvested or purchased. Make sure to label your herbs with a name and date! I can tell you from experience that Lemon Balm and Mint tend to look a lot alike, as do many other herbs. If you don't want to play the 'taste it and try to guess what it is' game, then make sure you label them! Also, make sure herbs pass the smell test before using. Just open the container and give it a big sniff. 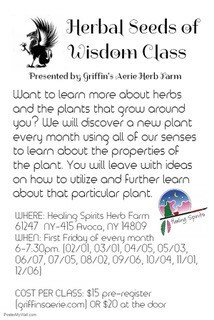 If the herbs smell rancid, moldy or just ‘off’ don't use them. If they don't seem to smell at all then crush a leaf between your fingers. This will release the oils in the herbs and should renew the scent. As herbs age they lose their potency and you may need to use a little extra in your recipe to get the same effect or taste. How long will dried herbs last? There is no definitive answer - it depends. Color, they should retain the same color as when it was fresh with very little color variation. Smell, herbs have distinctive odors that are an effective means to determine quality. They should smell strongly, not necessarily “good.” If they have no smell, they should be tossed. Remember Valerian will not smell nice, but as long as it smells like “dirty socks” it is good to use. Taste, herbs should have a distinctive fresh flavor, not necessarily good, depending on the herb, rather on the “potency of the flavor.” Do they taste Fresh? Vital? Strong? Distinctive? Effect, herbs must work effectively. If your herbs are not working, suspect first its quality. The shelf-life of an herb is determined by how long it retains its quality of freshness. Having the highest quality herbs is something that all herbalists should strive for, and it isn’t hard if a little care is taken. Labels with names and dates take all the guesswork out of it, and you can get into a system of replenishing when the need arises. Make your herbal apothecary your space, treat it like a special place, and your dried herbs will last for quite a while. If you follow these tips for storing dried herbs, you will have the freshest herbs possible in your herbal apothecary! Medicinal Mushrooms: what you need to know about our products! Posted 11/15/2018 3:56pm by Andrea or Matthias Reisen. Mushrooms support our bodies in many ways. Powdered mushrooms, from our farm, are mostly tasteless and can be added to smoothies, soups, sauces, your morning oatmeal.. or well.. almost anything! We like to mix a spoonful with a little Vitamin C powder and drink it with breakfast every day! We are producing a highly potent mushroom “superfood” that is stronger than extracts derived from the mushroom caps alone. "Mycelium" are the very start of the bodies (known as fruiting bodies) of the actual mushroom. 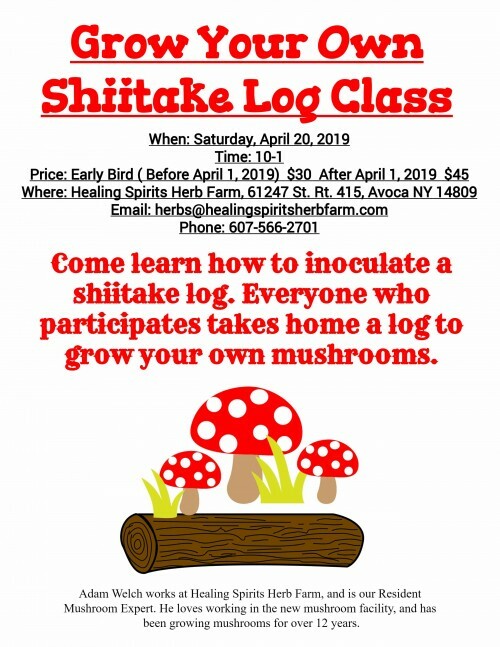 To explain further, we can think of mycelium as the “root” from which the body of the mushroom grows, and is generally known to be more potent than the mushroom caps themselves. Our cultivation and extraction process focuses on capturing this highly potent mycelium (powdered 'shroom caps will be present in small amounts as well). Our extracts contain no fillers and are rich in polysaccharides, arabinoxylans, and triterpenes. Beneficial compounds are already made available by the extraction process, we suggest that you simply add the powder to food or drink for an effective medicinal dose. Cooking with mushroom powder will not alter or hinder its potency so it may be added to soups, sauces, yogurt, smoothies, juices, or anything else you are already eating or drinking. Extracts are processed using gluten-free dedicated equipment with significant attention paid to preventing cross-contamination. We are SO EXCITED about our MEDICINAL MUSHROOM blends and will share more next week, hopefully! Check out the products page and stay tuned for recipes and new and delightful ways to add the power of the 'shrooms.. into your life! Posted 6/3/2016 1:31pm by Andrea or Matthias Reisen. I'm not a very bright woman. I'm stubborn and rebellious, and it takes me a long time to learn lessons and process things. However, I am humble. I will take a lesson wherever it presents itself. I have finally realized this is why I do farm work. For three hours yesterday at Healing Spirits Herb Farm, collecting burdock seeds, getting covered in the prickly seed heads of that tenacious plant; burdock and I had a conversation. We talked about my father, Mr. Tenacious Himself, the blood from which my anger, my stubborness, and my inability to give up, comes from. My father is the reason I am so strong, and also stubborn. He is the reason I rage sometimes, but also where my creative fire comes from. Scot-Irish and German is a strong mix; races of people who literally survived by their courage and fire they held inside, alone. Ask me about my history and I can tell you a hundred times that my ancestors , against all odds, survived. This is what we carry in our blood. But there is a price to pay for all that strength. The other side of such strength is anger, and stubborn pride. My father's family, farmers since agriculture began, is famous for it. I was angry for two days before speaking with the burdock. I couldn't put my finger on where my anger was originating from, only that I was feeling a sort of passionate rage, the type you feel in every cell of your body. I had been processing some long forgotten traumatic experiences, but the rage seemed to be coming from deeper then that. Even during yoga class, I nearly burned with the anger I felt inside. The deep relaxation was anything but for me. I lay on the floor, seething with anger. The burdock plant bit into me sharply with its' barbs. They grab at you, like rude children. The burdock is a detox plant, a liver renewer. It draws out poisons and toxins of all kinds, including toxic emotions. The burdock is also a survivor; it can grow in all kinds of environments, with lots of water or little water, in terrible soil or rich soil. It puts down deep deep roots to make up for less then tolerable conditions. I felt the burdock pulling my anger out of me. The burdock detoxed my mind and my spirit, as I struggled with it. At one point, I felt compelled to say out loud to the burdock "thank you, I will help you any way I can." I felt that the burdock said back "f*** you! I didn't ask for any help! I live and thrive all on my own.." I realized this is the type of attitude I have; I have it deeply embedded in me to be strong and never ask for any type of help. Plants are excellent teachers because they don't interrupt the internal work being done. They never give us any guru bulls**t or any advice at all, actually. They let us work on our own stuff, rage, yell, cry, laugh, whatever needs to be done, and yet, they are a conscious presence, holding space with us. I think the work I did with burdock may have saved me from future cancer. It may have saved me from an autoimmune disorder. When we let anger build up in our bodies, it literally destroys us. Anger keeps fluid from flowing well through our bodies, nourishing our cells. I don't think it is too far fetched to say that plants heal us from the outside in. The time we spend processing in the woods and fields, with the plants and trees, will save us painful hospital stays in the future. This is truly what I believe.